Last weekend at the mall, I saw a tall, portly man wearing that elusive Glamour Don’t of the holiday season: the Christmas sweater. The garment was bright red and featured a big Christmas tree appliquéd across the gut. Best of all, this gentleman made a bold fashion choice, opting to wear sweater tucked-in. To sweatpants. Soiled sweatpants. His wife was also wearing a Christmas sweater, albeit a more subdued one--white with a green wreath--that paled in comparison to his. Indeed, she could have almost passed for lucid had she not been holding hands with Jingle-Bell Frankenstein in sweatpants. The great thing about Christmas sweaters is that they make the holiday season a special time of year when the mentally ill can really feel free to share their psychosis with the general public. 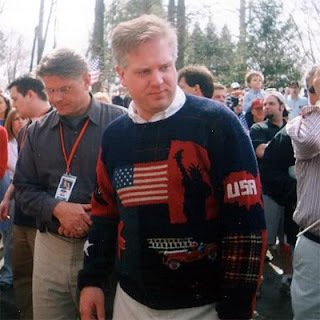 Unless of course you’re Glenn Beck, author of the book-turned-one-man-play, The Christmas Sweater. In that case, every day is Christmas. Oh god, I didn't know he wrote a book. How frightening. I like this quote: "We got a divorce because she was always backing me into the corner of garages." haha, what? Also, Christmas sweaters are cute on children, or people from the 1980s, but anyone else? No. Haha, Tsaritsa. Possibly dogs and cats can get the pass on the Christmas sweater, but more often than not even that is just SAD as well. Oh wow. I wonder if the movie version will make waves. I remember when that "American Tale" movie came out that made fun of Michael Moore, but it flopped pretty quickly. Conservatives make lousy creative types. I think Christmas sweaters are hilarious (hence, I wear them every year). Annah, pics please. Also, your blog is hilarious. i had a dude in sweatpants come into my work today. really, people? we can't be bothered to put on a real pair of pants? also, i totally want a hannukah sweater with a menorah on it and little led's so i can really make it lite up. Ugh. Men in sweatpants--that should not happen. Ever. Reama, I am going to look out for that Hannukah sweater for you...If I find one, I'll order one to send to Glenn Beck, too. Does anyone else kinda see 'Mr. Roper' in that Andy Williams pic? CREEPY!